CARLSBAD, Calif., August 2, 2018, — NTN Buzztime, Inc. (NYSE American: NTN), reported financial results for the second quarter ended June 30, 2018. Total revenues were $5.7 million, up from $5.5 million for the second quarter of 2017, as hardware revenue increases offset lower subscription revenue. Direct costs were $1.9 million, compared to $1.6 million for the same period in 2017, with the increase primarily related to higher equipment lease revenue and depreciation expense. Gross margin decreased to 66%, compared to 71% in the prior year quarter related to a shift in product mix. 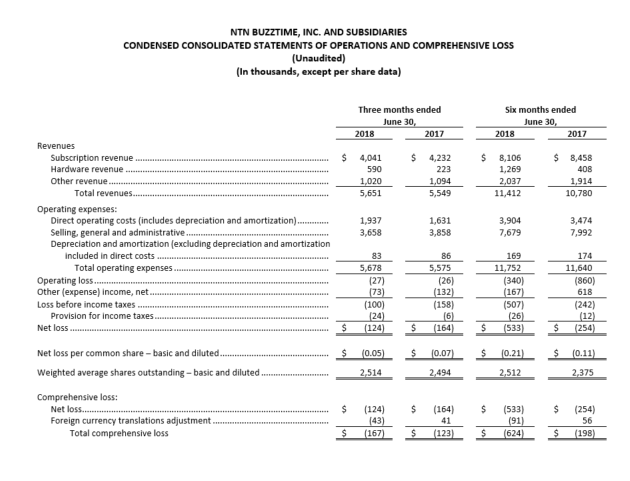 Selling, general and administrative expense was $3.7 million, or 65% of revenue, down from $3.9 million, or 70% of revenue, in the prior year quarter. 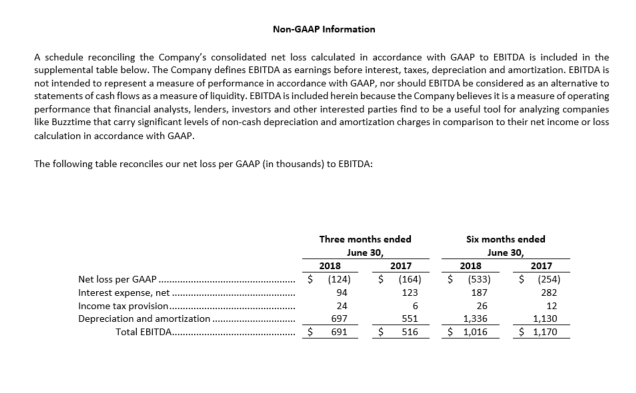 Net loss was $124,000, or $0.05 per share, down from a net loss of $164,000, or $0.07 per share, in the prior year quarter. EBITDA was $691,000, compared to $516,000 in the second quarter of 2017. The site count was 2,703 at June 30th and March 31st. Management anticipates the net site count will continue to fluctuate. As of June 30, 2018, the tablet platform installations increased to 2,247 venues, or 83% of the installed base, compared to 2,218 venues, or 82% of the installed base, as of March 31, 2018. In June, the company received $1.4 million in net proceeds from a registered direct offering. 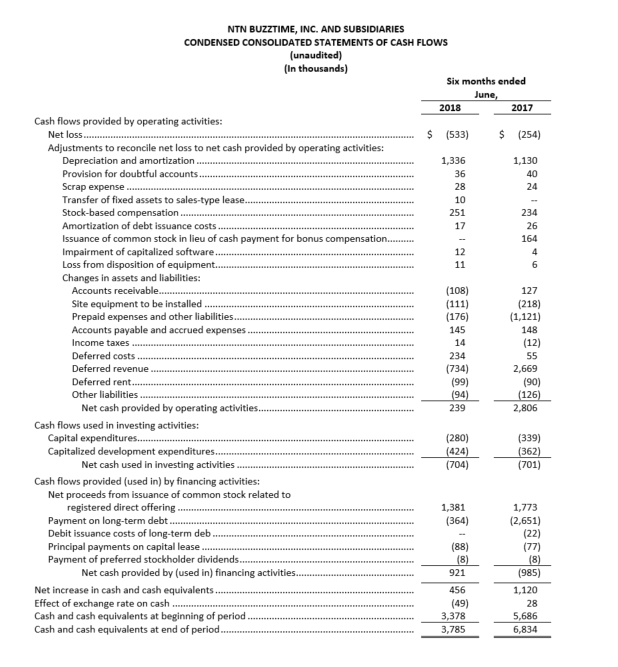 Cash and cash equivalents were $3.8 million at June 30, 2018, compared to $3.4 million at December 31, 2017. Total deferred revenue was $2.9 million, down from $3.6 million at December 31, 2017. The call will also be accompanied live by webcast that will be accessible at the company’s website at https://www.buzztime.com. The replay of the call will be available until August 9, 2018. 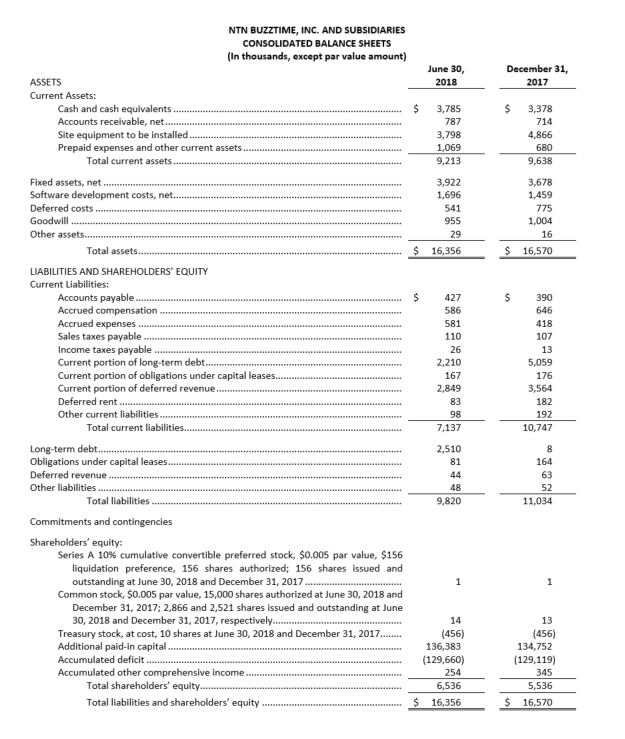 This release contains forward-looking statements that reflect management’s current views of future events and operations, including statements regarding management’s expectations regarding the release of future self-built games, the progress and impact of our product development investments and partnerships, new market and growth opportunities, and management’s execution of its strategy. These risks and uncertainties include the risks of unsuccessful execution or launch of products, platforms or brands, risks associated with customer retention and growth plans, the impact of alternative entertainment options and technologies and competitive products, brands, technologies and pricing, adverse economic conditions, the regulatory environment and changes in the law, failure of customer and/or player acceptance or demand for new or existing products, lower market acceptance or appeal of both existing and new products and services by particular demographic groups or audiences as a whole, termination of partnership and contractual relationships and technical problems or outages. Please see NTN Buzztime, Inc.’s recent filings with the Securities and Exchange Commission for information about these and other risks that may affect the Company. All forward-looking statements included in this release are based on information available to us on the date hereof. These statements speak only as of the date hereof and NTN Buzztime, Inc. does not undertake to publicly update or revise any of its forward-looking statements, even if experience or future changes show that the indicated results or events will not be realized. Buzztime (NYSE American: NTN) delivers interactive entertainment and innovative technology, including performance analytics and secure payment with Europay, MasterCard® and Visa® (EMV) chip card readers or with near-field communication (NFC) technology to accept Apple, Android and Samsung Pay. Most frequently used in bars and restaurants in North America, the Buzztime tablets and technology offer engaging solutions to establishments that have guests who experience dwell time, such as casinos, senior living and more. Casual dining venues license Buzztime’s customizable solution to differentiate themselves via competitive fun by offering guests trivia, card, sports and arcade games, customized menus and self-service dining features. Buzztime’s platform improves operating efficiencies, creates connections among the players and venues, and amplifies guests’ positive experiences. The Buzztime platform has also been recently resold and the content licensed for other businesses serving other markets. For more information, please visit https://www.buzztime.com or follow us on Facebook or Twitter @buzztime.